Are you ready for a belt that is made tough? This belt isn't just any old bet. It's made from military-style nylon. It's the best tactical belt you'll EVER come across. Feel free to use it in a number of scenarios for a variety of items. Works great as a holster belt! 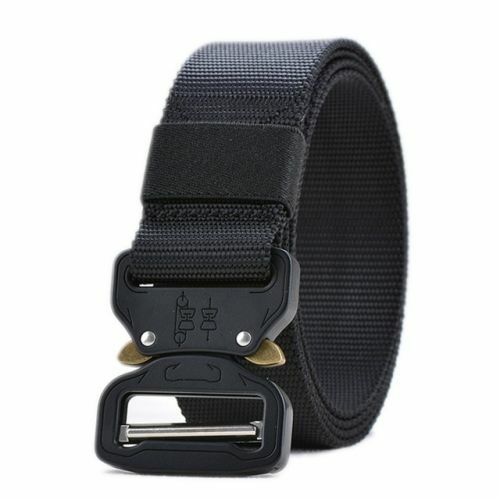 ADJUSTABLE: This belt is very easy to open and close when you're on the move. It's 100% adjustable to meet your unique needs. Feel free to use it as a holster for concealed carrying. Perfect for every day use. Sizes Up to 45 - 61: Our belt is able to fit almost everyone! Even has removable buckles! Great for a Variety of Activities: Use it while hiking, camping, casual use, police work, light combat, as a holster, and even as a utility belt. High-Quality Materials: Made from ultra tough lightweight military material. The belt buckle is made of heavy duty metal. The canvas cloth and durable metal buckle make it strong enough for a variety of activities. 100% Waterproof: Waterproof fabric makes this epic belt great for outdoor activities. The material is strong and made to last. High Quality: Our fully-functional tactical belt buckle always stays locked unless you unbuckle it. It'll never bend, slip, or sag. The material is designed with thick threading and it won't rip. Feel free to wear the belt with whatever garments you desire. INDESTRUCTIBLE TACTICAL JACKET - TOUGH AS NAILS!